Must have been about 12 or 13 when we finally got a Hi Fi VCR and a pair of Axiom speakers, which I see from the blurb in front of me, coincidentally, was only very shortly thereafter that Axiom got their start in Ontario's great white north of Algonquin Park. 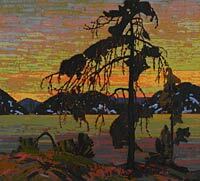 See Tom Thomson's painting with which I open this review to appreciate the majesty of the setting. As the story goes, Axiom began when Ian Colquhoun built a pair of speakers in a friend's garage and the friend immediately bought them. (Wish I had such friends). My childhood, I must relate, was spent in a house filled with books. We did not have what might be called a stereo. Music for us came out of German tabletops pinned to NPR or the CBC and one of those suitcase record players with a reversible stylus. One of the radios survived and suppose that is when I began my love affair with valves. We did not have a stereo because my mother, how else can I say this: to this day hates music. Whether it is at the symphony or in the elevator, it's all the same to her: noise. Although my father likes music, he loved my mother more and in an act of supreme marital compromise secured for them season tickets to the Opera. At the Opera, at least, there was often a decent story and perhaps a nice set to hold one's attention. For my father there was the opportunity to hear live and un-amplified the greatest instrument of all, the human voice, and of course a symphony orchestra. Compliments, however, of my father's wild and crazy bachelor years as he did manage to smuggle into the marriage a fine collection of classical LPs including many much admired RCAs and DGs which I still have the crackly pleasure of listening to today. Not only did everyone else in the neighborhood have a hi-fi, which I took very personally, they also had VCR. The lack of a VCR or even a hi-fi in our home was a constant source of embarrassment. That said, few today would doubt that I haven't made up for this deprivation since. For years my father weaseled his way out of getting us a VCR or Stereo � perhaps saving us the wrath of Judy � by claiming that the sound quality was not up to par and that the vinyl record was an archaic technology up there with kerosene lamps and cars with starter handles. This was sort of true, but ultimately disingenuous as Phillips was just about to launch the CD and the Hi-Fi VCR had arrived. So, the years' old excuse, which my father had no doubt read in The New York Times no longer held, an event that was also no also doubt announced in The Times. My father was, as a work colleague would say, hooped. A trip down to the local audio shop later, a very expensive Hi-Fi VHS was ours. I already had a NAD 3020B secreted away, but related to my father on the way home that we would need a new pair of speakers to go with our new VCR if we were to hear the better sound for which we had waited so long. CD players were still very expensive, but I did have an old BSR. And where can we get those, my father asked? A visit to a local hi-fi shop, long since gone, and into the car went a pair of vinyl clad Axioms. That must have been twenty years ago and I am listening to them right now. At home, I hooked the Axioms to the NAD and the VCR to the TV and we were in business. I even remember two of the first three videos we rented. The Wall and A Clockwork Orange. Think my sister rented Annie. Looking back on it, it's lucky the VCR was not returned the same day. A short while later came a Teac CD Player and a little later a Revox linear tracker. I still use the Revox, but the Teac has long packed in. That, however, was some time ago, but a few things have remained the same. Axiom has continued to offer vinyl clad, unobtrusive, high quality loudspeakers at low cost that punch well above their price point. But whereas Axiom used to sell through normal hi-fi retail channels, Axiom now only works as a direct seller, selling over the phone and Internet. And whereas the bookshelves on my desk are slight in size and weight with nasty push clip speaker terminals, the EP500 subwoofer under review today weighs in at more than 70 lbs and may hardly be described as unobtrusive in any setting. And let me just say at the outset that while I have used subwoofers before, nothing prepared me for the subterranean depths to which this one eyed 500 watt DSP leviathan plumbed without breaking a sweat. Ian Colquhoun, the man behind the 20 year old Axioms I am listening to today and father of the EP500, is a member of that famous body of speaker designers who served their time at Canada's world famous (world famous in Canada and Hi Fi at least) National Research Council under the direction of a certain Dr. Floyd Toole. Fellow NRC graduates include Mirage's Ian Paisley and PSB's (Lenbrook) Paul Barton. While this homegrown cult often displays common traits such as rear mounted tweeters, multiple drivers, use of modern driver materials, a hunger for power, a sympathy to solid state, an emphasis on reflected sound, a penchant for speaker model names starting in m, and an understanding that imaging (as, say, opposed to image or power) is not everything, Axiom is perhaps the most conservative in design with drivers on the front, binding posts and ports on the back. I am not, however, reviewing a conventional floorstander or bookshelf, but rather that relatively new category of speaker, the subwoofer. The first indication that the EP500 was not your average home theatre subwoofer was the grimace on the FedEx man's face rolling the dolly backwards and up the steps to my front door. He was rather glad to find someone home. In the rather sizable box came all that you could want in a sub, complete with a rather nifty box full of spikes, rubber footers and hex key for installing the supports of your choice. I went with the rubber feet, which turned out to be the right choice as I used the sub in a number of different locations and am sure I would have damaged the floors had the spikes been installed. 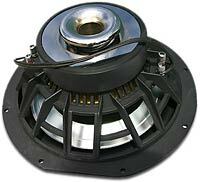 The sub is so damn heavy that I don't believe much was lost by not using the spikes, but if you were to set up this subwoofer in one place, spikes through the carpet onto concrete would no doubt be the way to go. I also think a tutorial and perhaps even a subwoofer setup test disc would not go amiss in the package either. In any event, I made my own with Audacity and Nero. The only thing i wish for is real wood veneers. And if it sounds like I am being harsh on speaker finishes, I am. Some things change. Some things don't. While good quality and of a color and imitative grain that I like � rosewood � the wrapping of the subwoofer is at the beginning and the end of the day, well, vinyl. And the only thing which I like less in a speaker's appearance is that other Canadian speaker manufacturer favorite, piano, high gloss black. 3-inch dual voice coil as seen from Behind. Setup was relatively straightforward, with a slight twist, as what I had planned in my mind before the sub arrived was not to be. I first �snuck' the EP500 into a front sitting room where my low power, vinyl and single-ended tube rig with my Bert Doppenberg designed tapered wave quarter pipe cross-overless speakers. What I had hoped to do was to pass the output of the pre-amp through the sub and on to my Audio Note Kit 1 and then on to my single-driver speakers that everyone other than me seems to hate. Due to reading Keith Howard's articles on subwoofers, I figured this was the way to solve my former subwoofer integration woes. (To be frank, subwoofers and I had not got along before my introduction to the EP500). My idea was to use the high pass crossover in the sub to the single-ended amp to give both the amp and the speakers an easier time of it and let them do what they do best, the midrange. What I wanted the EP500 to do was what I missed the most from this setup, bass. However, the EP500, being DSP driven, is not like most subwoofers. It has no high pass output, line level or otherwise. You may power it either by high level speaker inputs or by a second pair of outputs from your pre-amp, or directly from an amplifier that has its own sub bass management, but there is no way to tap the EP500 as a crossover for your satellites. For me this was a significant deficit, though few will feel the same way as I did as I don't believe this is the intended market for this monster. The EP500, therefore, was driven in the conventional manner through a separate set of summed pre-amp outs with the single driver speakers and the single ended Audio Note Kit 1 amp run full range. Axiom has, however, told me that my idea is an interesting one that they may well incorporate in future models. I won't hold my breath. Surveying other modern subwoofers that employ digital signal processing to reap more performance and safety out of smaller boxes. I see that the lack of a high pass out, either high level or line level is not at all uncommon these days. Moreover, in a multi-channel audio only setup or that with a home theatre receiver, which employ integrated subwoofer bass management, this is unlikely to be noticed. According to Axiom, this is how the EP500s (and their big sister the EP600) work. The EP500 is a conventional ported cube of rather large dimensions with a single 12-inch aluminum coned long throw forward-facing driver with dual voice coils, situated just above a port that looks like a leering clown or a Japanese Noh Mask. Inside and around the back, therefore, is where the EP500 differs from your average home theater sub. 3) The subwoofer (in an anechoic chamber at least) puts out bass within 1.5dB over its advertised range of 100Hz to 20Hz. Employing a programmable digital signal processor has other benefits as well. The output of the sub can be tuned to the size of the room. The crossover point can be set accurately in 20Hz brickwall increments. And the firmware can be upgraded through the rear mounted USB port. In a trick which I don't quite get, while the subwoofer's amplifier is digital so as to save your fuse box, the amplifier's power supply is �analog' and not �switching'. This hybrid arrangement is supposed to give the sub extra headroom that an otherwise switching power supply could not supply without the subwoofer exhibiting nasty digital clipping during the very loudest of musical passages. More details about this can be found on Axiom's really rather thorough website. Backside of the sub, aside from the lack of a high pass feed, is a full-featured compliment of sub controls for room size, crossover frequency, phase, and level. There are high-level inputs with some of the best looking speaker binding posts I have ever seen as well as mono balanced and unbalanced inputs and outputs. All controls and connectors are of the highest quality and the whole are placed on a beautiful brass back-plate. Perhaps because of the intrinsic efficiency of the digital amplification, there is no obvious heat sink. One feature that I understand is becoming more and more de rigueur with subs of this class are remote controls so that you can adjust the various parameters from the comfort of your couch, rather than running back and forth until you're happy. I mitigated this problem somewhat by placing the sub in my two channel set up beside my couch, so I could adjust the levels by leaning over while being careful not to spill my drink. Again, a small thing. So positioned, the EP500 also served as a nice coffee table, though I would recommend the use of coasters at all times and ban plant pots outright. In the two channel single-ended setup � where the subwoofer is used the majority of the time -- I set the crossover at its highest point, set the sub to half room and dialed in level just until it became seamless within the system. I imagine that was perhaps using only about 10 percent of the sub's capability (if) but very much enjoyed the added weight and heft that it brought to the proceedings. My main speakers sounded bigger than they were: cello, bass guitar, and the Opera at the Met, was all more fulsome and majestic in presentation. From filling out the bottom half of Jacqueline Du Pre's Cello, Eminem's rants against his mother, to those ominous deep bass notes on the SACD of Dark Side of the Moon, all were listenable through the quarter wave pipes in a hallucinatory washing over you kind of way that my single-driver speakers could not provide alone. Also, unlike most subwoofers, I was very much able to set and forget the sub. The single ended set up will only play so loud and I never stretched it to play any louder - that's not its purpose - but the EP500 slotted in nicely, almost seamlessly, and was a welcome addition. My main impression with the single-ended setup was that, unlike just about any other sub tried, this subwoofer was suitable for music. It was indeed hi-fi. What this means is (and this may sound so basic as not be worth saying) with little fiddling one could get this sub to cross-over more or less seamlessly, add at least an octave or so to my mains and it did not shout from the floorboards �home theatre subwoofer, not to be used for listening to music'. This, I would find, really only applied to speakers with limited bass output. If your speakers already reach to the depths, you may be gilding the lily. Downstairs beside the 50-inch DLP things were very different. With a purported 100 or so watts available per channel and largish floor-standing multi-driver speakers, some sensitive, others not, I believe I was able to re-create concert level loudness. On movies such as War of the Worlds, bass was so prodigious as to rattle the house through the concrete floor. It may not be music, but it was a helluva a lot of fun and unlike most subwoofers I have used there. 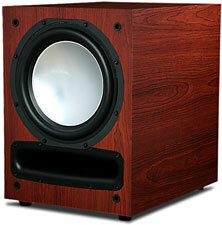 This subwoofer did not just give the impression of deep bass, but actually gave deep bass. Using the sub woofer bass management of my home theatre processor and using the EP500s direct input selection plus carefully rolling back level and experimenting with various trim settings, I was able to do a very fine job of integrating the subwoofer into the system. Something never before achieved. Never in my life have I heard bass go so confidently low and load the room so convincingly. When the aliens declared war on our world, the whole neighborhood knew it. But this subwoofer was never about boom. It could be carefully rolled back to integrate with the main speakers so as to be unobtrusive. In a two channel setup staring a half kilowatt power amp and a pair of Tannoy D700s I noticed something which I suppose also distinguishes DSP driven subwoofers from their analog equivalents: crossover slope. As far as I can tell, with the EP500, there is no slope. It's a brick wall that you set by choosing a particular detent on the back in increments of 20Hz. Unless there is musical information below the setting you give it, you will not hear a damn thing. I am sure this is just a software design choice and that different sort of slopes from black diamond to bunny run could easily be added. While I believe the trim settings are to counter this, I was not able to satisfactorily set it with the Tannoys. As is, my Tannoys go very deep, supposedly down to 30Hz, and other than absolute loudness, I preferred the Tannoys without the subwoofer � a very different experience to what I enjoyed with the single-ended setup or beside my DLP. Somehow, I was just unable to integrate the subwoofer with those speakers without it being quite obvious that there was a subwoofer in place. Bass seemed disintegrated, of a different character and seemed to be coming from a place other than the music. Had I employed an outboard crossover for the Tannoys, my experience I believe would have been very different. The problem, it seems to me, is that most main speakers don't give up bass output all at once but that it gradually tails off, except perhaps for a speaker from Meridian and normal rules don't apply. So without an active digital crossover separating both high pass from low pass, integrating satellites with subwoofer will be a trickier proposition than might otherwise be supposed with best results had with speakers that have quite low ultimate bass output as opposed to truly full range speakers. By and large, if my experience is any indication, subwoofers have deservedly garnered a bad reputation because they are, by and large, no good. They boom. They wallow. They stand out. They are slow. They do not integrate. You are always running back and forth playing with the controls. But when a sub does what it ought, fill in the bottom line and get itself the way out, it is a good sub and this is what the EP500 is in spades. It's there, but it's not. It adds �there' there but can be set to be only aware by its absence in the way that garlic should be with cooking.